The French words vert and mont. Put together they say Vermont. And from all over they come to see. The gemstone is the garnet grossularite. The rocks are marble, slate and granite. The state insect is the honeybee. And the sugar maple is the tree. Montpelier is the nation’s smallest capital. Less than nine thousand people there. Okemo, Killington and Mt. Snow. Born in Litchfield, Connecticut in seventeen-thirty-eight. 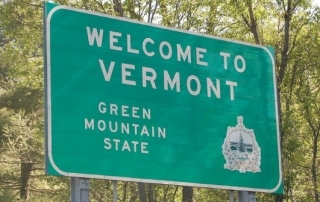 Had claimed this Green Mountain state. Claimed all this state’s land for France. Until 1996 they finally got their chance. Waste to the local farmers. A recommendation from these charmers? A few famous names that should be seen. Davenport, Douglas and Brigham Young.